In addition to the book and LP, The Medium Is the Massage was also made into a 54-minute film distributed by McGraw-Hill Education in 1967, and was broadcast on NBC on March 19, 1967. McLuhan Galaxy has a larger write up about it, and The Medium Is the Massage film is available on YouTube. This class will examine the challenging possibilities now open for literary study and literary theory. It considers works from Blake to Borges to cyberpunk; works with online materials and literary archives; wrestles with modern rhetorical and digital theorists; and experiment with creating online texts and critiquing them. As I put the course together, I found myself leaning towards incorporating more digital humanities and comparative media studies while addressing how digital technologies are changing our notions of texts and textual engagement, literature, pedagogy, and composition. As I put the syllabus together, I ended up with a fairly long course introduction, but decided to keep it. I thought I’d share it here. In the months of May and June, readers of the New Republic were treated to articles about the end of English Departments, soon to be killed off by technology in the guise of the digital humanities. In his article, New Republic Senior Editor Adam Kirsch decries the doom he believes technology is wreaking. Less alarmist, James Pulizzi also sees the end of the traditional literature department as all but inevitable, not because they must die but because they must shift and adapt to the new digital environment. It is true, as Pulizzi suggests, that literature departments, especially English departments, are changing, even need to change. But that’s nothing new. English departments have always been changing. We might point to the 1800s where at schools like Harvard one of the most prestigious professorships was the Boylston Professor of Rhetoric and Oratory, or to the late 1800s when American English departments did not teach American literature – the first American professor of American literature had to jump ship from his literature department for a department of history. Or we might point to the 1940s and the rise of the then New Criticism, or to the 1960s as the start of a series of waves of post-structuralist and post-modernist theories and perspectives including but not limited to feminism, gender studies, New Historicism, postcolonialism, multiculturalism and ethnic studies, ecocriticism, trauma theory, memory studies, New Materialism, object-oriented criticism, and speculative realism. Or we might look again to the 1960s and the revival of classical rhetoric and the beginnings of contemporary composition studies, followed later by the growth of professional writing and technical communication. Kirsch believes that the answer is no, and therein lies the problem with his attempt to defend the humanities from technology. Renaissance Humanism was born within the newly established printing houses of Europe. The first Humanists did not just learn how to set type and publish books, they embraced the printing press; got their hands on as many hand-written manuscripts of Greek and Roman literature, philosophy, mathematics, and science as they could; set them to type; and published, published, published. Kirsch is unaware of these facts because he is trapped within a catch-22. To be aware of how the printing press gave rise to Renaissance Humanism, Kirsch would have had to have studied the history of media technologies, something which he seems loathe to do because he believes it to be antithetical to humanistic concerns. 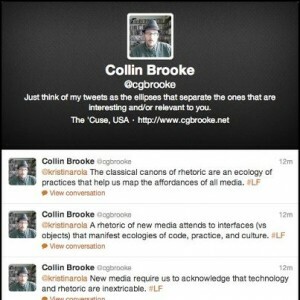 As Hayles and Pressman argue, that we are transitioning from a print to a digital culture allows us to more readily recognize that print and its modes of thought, patterns of behavior, and organizational structures were a temporary condition fostered and encouraged by a technology around which we shaped our culture. That era, the Age of Print, is ending, just as the manuscript culture of medieval scholasticism ended with the rise of print. And that is what this course is about: In recognizing, as DJ Spooky reminds us, that shifts in the traffic of communication will alter modes of thought; in seeking to understand the workings of electronic and digital media, as Marshall McLuhan suggests we need to do, so that we might understand the social and cultural changes around us; in revising the ways we practice English studies even as we maintain our symbolic codes so that we might, as A.N. Whitehead argues, stave off cultural stagnation. If “the business of the future is to be dangerous,” then the answer is not to hide from it but, as McLuhan suggests, “to contemplate what is happening.” Or, as Michel de Montaigne, the Renaissance writer and inventor of the essay – a genre thoroughly entwined with the rise and logics of print – once wrote, “The thing of it is, we must live with the living.” That is what this course is about: To understand how English studies might live within a digital world. 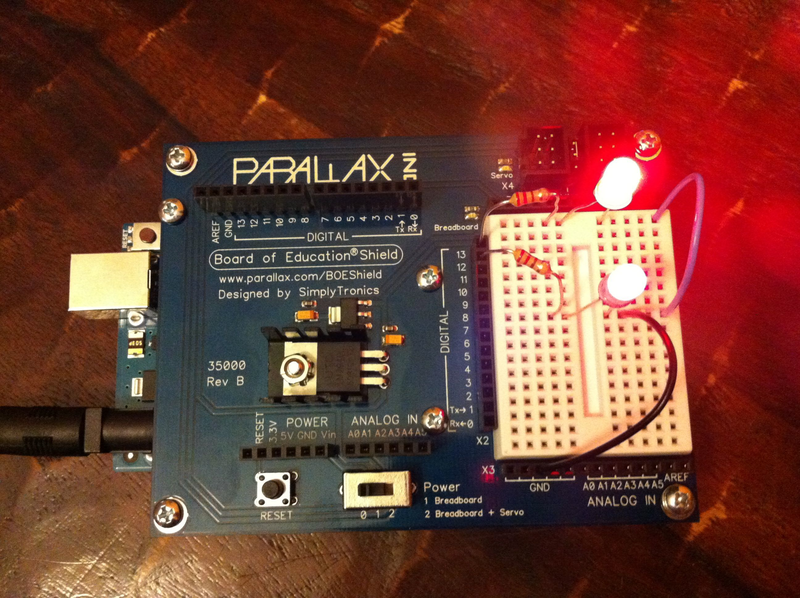 Parallax BOE Shield and Arduino – the brains of our BOE robot. I’ve been meaning to write for some time about my growing interest in making, specifically in Arduino, Processing, and paper circuits. While I’ve tinkered with coding over the years, I’ve never had an interest in electronics, at least not until last summer. I bought an Arduino last September, sponsored a high school making club during the fall, designed a Making and Writing course before I decided not to teach at the high school this spring, and introduced Arduino-based robotics and Processing into our homeschooling curriculum. (Oh, btw, as of this fall I’ve been co-homeschooling a 9th grader. I really should be better about blogging.) I’ll post more about my making activities and how they fit into my academic endeavors soon. In the mean time, here’s a post on making and the physical-digital interface I’m cross-posting from my Day of DH blog. As a technorhetorician, a media ecologist, and a digital humanist, I’m becoming increasingly interested in the physical-digital interface of physical computing and interactive programming. A lot of this interest is playing out in my exploring both the Arduino microcontroller and the Processing programming language. As the Arduino programming language and integrated development environment (IDE) are based on Processing, the two work quite well together. For instance, there’s the example project that interfaces an Arduino with Processing to creating an RGB LED lamp, the color of which is based upon word frequency within an RSS feed, or the much more simple example of simply turning on an LED by mousing over a Processing-created image, which I was able to do in just a few minutes. You can see the results in this Vine. Apologies for the shaky video – I held my phone with my weak hand as I used my better hand to control the mouse. to Waldek Węgrzyn’s Elektrobiblioteka that uses conductive paint-based silk screen printing and a small embedded microcontroller to create touch-sensitive illustrations that call up and interact with digital content. While I’m still learning both Processing and Arduino, as a digital humanist I’m often thinking of the ways in which we might use a visualization and generative art program like Processing to process and interact with text. For instance, there’s this fairly straightforward visualization of Goethe’s Faust and this “tube map” that’s created by inputting text. More interesting, however, are things like the codeable objects Processing library and the potential for interactive books making use of paper circuit technologies and embedded microcontrollers. Three tasks I’m working on today is organizing a session on making, making pedagogy, and critical making and design for CCCC 2015, brainstorming a possible DIY craft and making workshop for the same, and figuring out if I’m ready to propose a paper circuits workshop for THATCamp DC at the end of this month. You can find the tutorial at Jie Qi’s The Fine Art of Electronics. The Variable Media Questionnaire is resource for helping creators think about sustainability and preservation of their digital work, originally designed by Jon Ippolito while working in the curatorial department of the Guggenheim and now faculty at the University of Maine’s New Media Department. The project, in its third generation, is now being developed by the University of Maine’s Still Water lab under the direction of John Bell. The Variable Media Questionnaire is designed to help a work’s creators and users write guidelines for translating their works into new media once the original medium has expired. This Questionnaire is unlike any protocol hitherto proposed for cataloguing or preserving works. It requires creators to define their work according to functional components like “media display” or “source code” rather than in medium-dependent terms like “film projector” or “Java.” The variable media paradigm also asks creators to choose the most appropriate strategy for dealing with the inevitable slippage that results from translating to new mediums:storage (mothballing a PC), emulation (playing Pong on your laptop), migration (putting Super-8 on DVD), or reinterpretation (Hamlet in a chat room). Ippolito has a short article on the questionnaire, “Accommodating the Unpredictable: The Variable Media Questionnaire,” which is taken from the book Permanence through Change: The Variable Media Approach. Series editors Liza Potts and Kathie Gossett announced today the launch of a new book series Practices in the Digital Humanities with a partnership between the University of Michigan Press and Matrix Center for Digital Humanities and Social Sciences. This book series is focused on the practices of the digital humanities by providing best practices, models, case studies, and examples of how to build to standards, architect experiences, manage systems, and manage projects. Bringing together experts from across the digital humanities, this series will be written by digital humanities scholars for digital humanities scholars. This series will also provide digital humanities graduate students with a much-needed source for the practice of digital humanities. This book series will fill a major need for books on practice from the digital humanities perspective by providing specific examples of how to design, develop, and maintain digital humanities projects. For this series, we have identified some initial topics. This list is in no way comprehensive; we encourage you to propose books outside of the topics below if they relate to practices in the digital humanities. 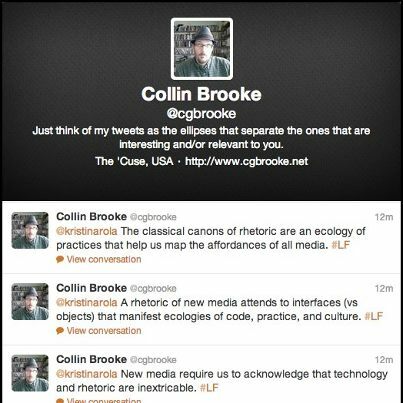 Collin then captured the three tweets in the pic you see above. I’m particularly struck by the third tweet which is a nice summary of what I’m doing when I’m working to tease out various conceptions and practices of memoria. kind of . . .